Bonaventure Cemetery – one of Savannah, Georgia’s most famous haunted spots. And this is one of its most famous haunted stories. Written by Shaun Jex, photos by Kara Jex. Bonaventure Cemetery sits beside the Wilmington River, just outside of Savannah, Georgia. Towering live oaks draped with Spanish moss and adorned with tillandsia cover the grounds, imbuing the area with a sense of both reverence and foreboding. The cemetery gained national fame with the publication of John Berendt’s Midnight in the Garden of Good and Evil, which told a true story of murder, revenge, and voodoo in the steamy heart of Savannah. 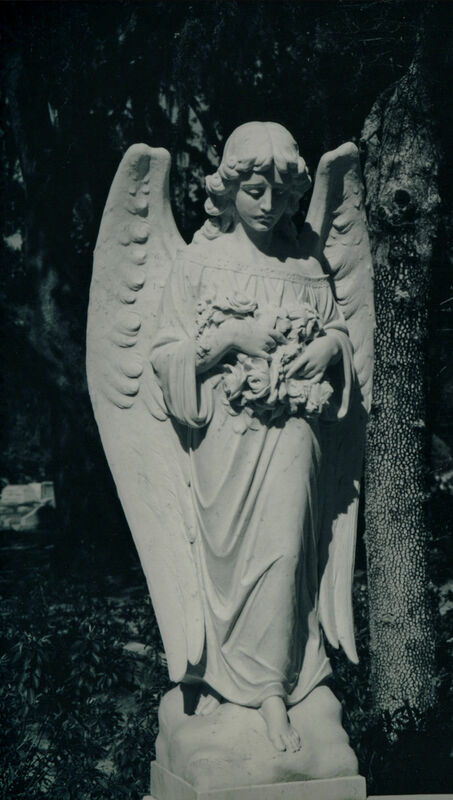 The book’s cover image, a photograph of the “Bird Girl” statue (named Little Wendy by the family who purchased it) was located in Bonaventure and became a place of pilgrimage for fan’s of the book. The traffic became so constant that the statue was later relocated to the Telfair Museums, and eventually landed in the Jepson Center for the Arts. 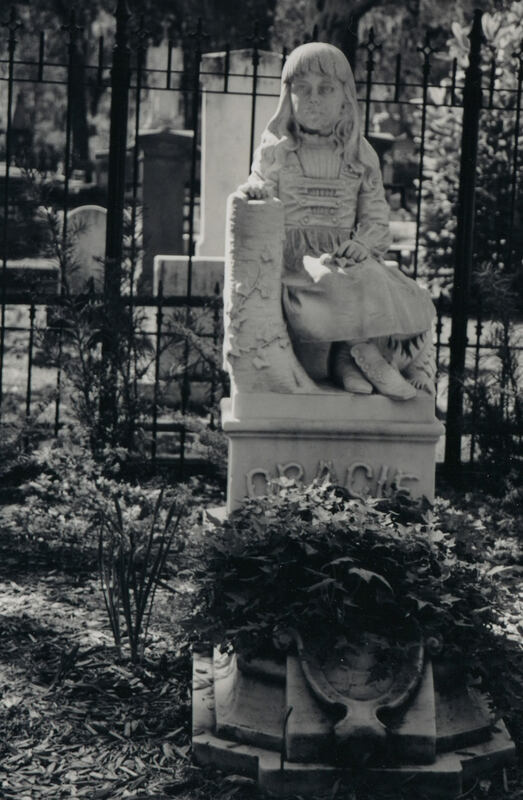 Visitors to the graveyard can gaze upon poet Conrad Aiken’s headstone and muse upon its inscription, which reads, “Cosmic Voyager, Destination Unknown.” Those with a penchant for the supernatural can search for the grave of Little Gracie. Her story is a sad one. The daughter of W.J. Watson, manager of the luxurious Pulaski Hotel, Gracie became a popular figure in the city of Savannah. Locals mourned when she contracted pneumonia and died at the tender age of five years old. Her parents eventually moved and are buried elsewhere, leaving poor Gracie alone in Bonaventure. Not content to merely rest in peace, her spirit is said to frequent the former grounds of the Pulaski Hotel, where she is often seen playing. All of these passing strange wonders are available to the visitor willing to stroll the cemetery’s expansive grounds, but there is one in particular that captures the spirit of both Bonaventure and Savannah. It is the story of an 18th century dinner party that continues on in constant celebration to this very day. It seems that long before the land was a cemetery, it was home to a sprawling plantation. The owners of the plantation were well known socialites, known for the grand parties thrown at their mansion. One autumn evening, near the date of the Harvest Moon, the couple decided to host a fête. Guests came adorned for masquerade and a fabulous feast was cooked by the couple’s servants. That evening, as the revellers ate and drank, a servant approached the master of the house. He informed him that a fire had broken out in the kitchen and was rapidly spreading. Attempts to stanch the flames were fruitless, but the plantation owner did not despair. He called together the rest of his servants and ordered them to carry the tables, chairs, and food outside where his guests could continue the party. Once relocated, the men and women continued to eat, drink, and dance by the brilliant light of the flames that consumed the house. When, at last, the feast came to its inevitable conclusion, the master of the house raised a toast. He declared his wish that their revels might never end. When finished, he dashed his glass against a nearby tree. The guests followed suit, causing the sound of shattering glass to mix with the pop and hiss of the blaze. Some say that some sympathetic power granted their wish and that the feast continues to this day. On late autumn evenings you can still hear the tinkle of breaking glass mingled with the phantom sounds of laughter, music, and crackling flames. In Savannah, neither death nor time will make the party stop. For more information, visit the Bonaventure Historical Society.